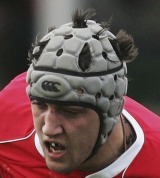 Josh Turnbull represented Wales at under-18, 19 and 20 levels, and played in two IRB under-19 World Championships. He made his debut for the Scarlets against the Exeter Chiefs in 2007 and was a first-team regular by the 2009/2010 season. In January 2011 he was called up to the Wales squad for the Six Nations ahead of veteran flanker Martyn Williams. And he made his debut as a second-half substitute in Wales' victory over Scotland at Murrayfield in the second round of the tournament.